Per The Guardian, Haas F1 team head Gene Haas is bidding on the assets from the shuttered Marussia F1 team. Haas plans to use Ferrari power units in 2016 just as Marussia did this year, so scoping out a former Ferrari-powered team's resources makes sense. The auction is taking place today and tomorrow and has many interesting pieces up for sale. "We have got the Marussia auction list so I think we will be bidders for some of that stuff," said Haas. Haas wants to take what Marussia's been working on and improve upon work that's already been done to save time and resources to get the team up and running. If we did it the way Caterham and Marussia did it we would have the same result so I think we are going to do it differently. A lot of the teams in the UK build everything themselves. They seem to have this English mentality that this is the way it has to be done and that is just not our business model at all. The auction is live here and runs through Wednesday if you'd like to bid on any of the former team's items. 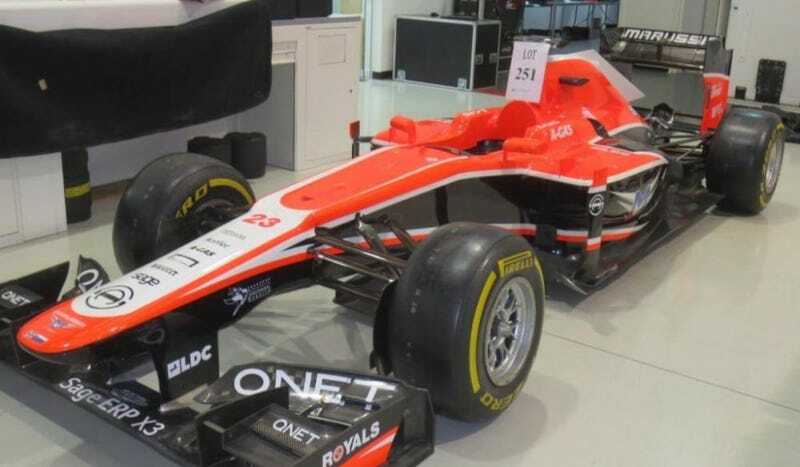 Marussia closed their doors in November and missed the last three races of the Formula One season due to financial difficulties. Proceeds from the auction will pay off the remainder of the team's debt. Haas may be interested in Marussia's facilities as well. The team plans to split the design and race operations between two locations. The design operations will be located in the United States alongside Haas' NASCAR team headquarters in North Carolina. For race operations, Haas wants to be in the thick of it just like all the other F1 teams based in England. Haas hopes to employ about 250 people in the United Kingdom. "We looked at a place in Abingdon and there are several available in that area. I guess it might be a possibility to take a look at the Marussia HQ too," said Haas to The Guardian. Fans are bemoaning Haas not starting from a clean slate with a 100% new design, however, if other recent new teams haven't had success developing new designs from the ground-up, what Haas is doing makes more sense. The costs in Formula One are too high to get it wrong and remain a functional team.